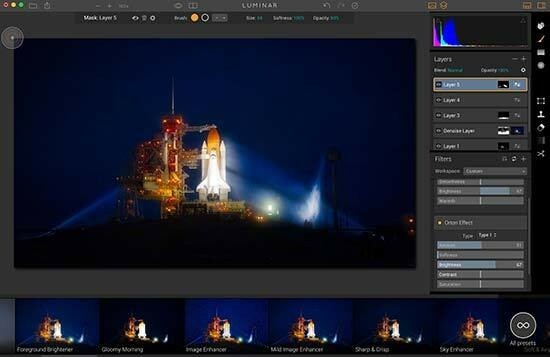 Luminar is a new piece of photo editing software, which has been designed to be used by photographers of different skill levels - whether you’re a beginner or a more advanced, or even professional user. 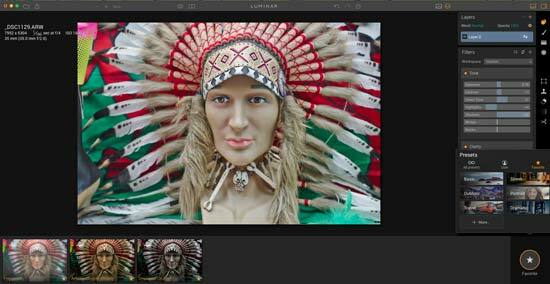 It can be used as a standalone application, or it can also be used as a plugin for a variety of other photo editing applications, such as Photoshop, Lightroom, Aperture and so on. 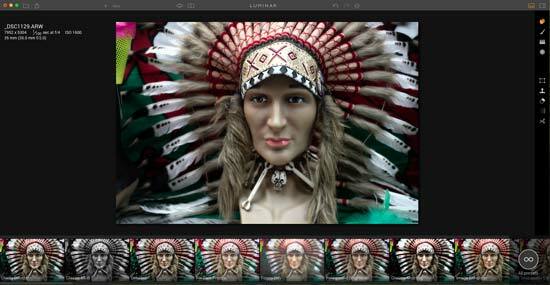 While other MacPhun applications tend to concentrate on one particular function, Luminar is designed to be a full non-destructive suite that can handle raw files, as well as other file types, such as JPEG. MacPhun Luminar will be available to pre-order until the 17 November, where it will become available to download for all. Downloading and installing the Luminar app is a very easy process. 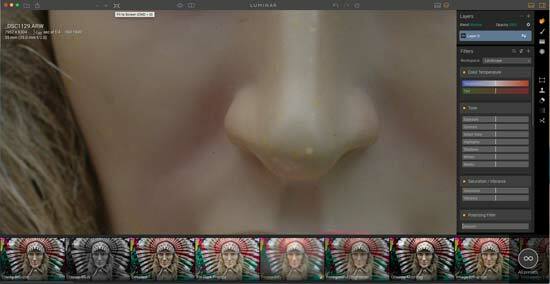 You download it from the MacPhun website, installing it just as you would any other program. 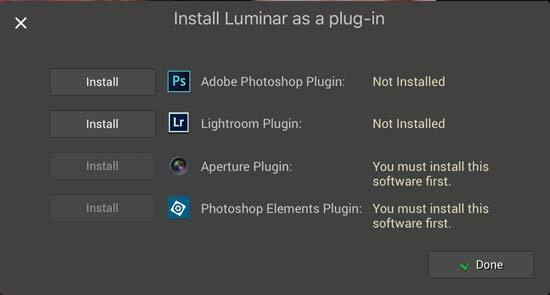 Luminar, like other MacPhun software, is only available for MacOS, and is not Windows compatible. When you first open the software after installation, you’ll be prompted to decide whether you want to try it out on a trial basis, or to purchase and input a code to unlock the full version. It can be worth trying it out before you make the full purchase just to make sure you want to proceed with paying for the upgrade. MacPhun has designed this software to be easy to use, whether you’re coming from a beginner background, or you’re a bit more used to working with photo editing software. As already mentioned, it can be used as a plugin, but for the purposes of this review, we will mainly be looking at how it works as a standalone editor. That said, the first time you open MacPhun Luminar, you’ll be asked if you want to install it onto any other photo editing software you already have installed on your machine - such as Photoshop. Simply click Install and the plugin will be activated ready for the next time you use one of those pieces of software. The initial interface of Luminar is relatively straightforward and simple, which is good for not overwhelming you when you open it. To open a file, go to File > Open, or if you’ve recently been working on a file, you might find it in the Open Recent command. You can open lots of different file types, including proprietary raw files, such as .NEF Nikon files. As soon as you open a file, you’ll see that a range of presets appear at the bottom of the screen. You don’t have to utilise any of these if you don’t want to, but straightaway you can enjoy one-click changes. You’ll see that the thumbnail gives an indication of how the image will look with the preset applied. As far as edits go, you could end there and save the image straightaway. By default, all of the presets are shown, but you should see that if you hover over any individual preset, a star appears which you can click on to add it to your favourites if you think you’ll want to use it regularly. Now, if you click on the “all presets” icon to the right of the presets bar, you’ll be able to go straight to your favourites. You’ll also note that the other presets are grouped by type, again making it easy to go to a particular style you want to use. You’ll also see a tab for any user presets you’ve made yourself - there will be more on how to create those later. 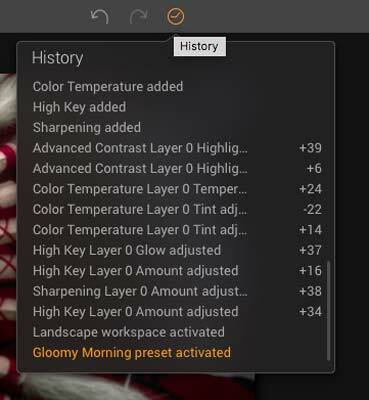 If you don’t want to see the presets bar, perhaps when you’ve finished adding any presets, you can click an icon on the top right hand side of the main window, and your image will expand to fit the work area. 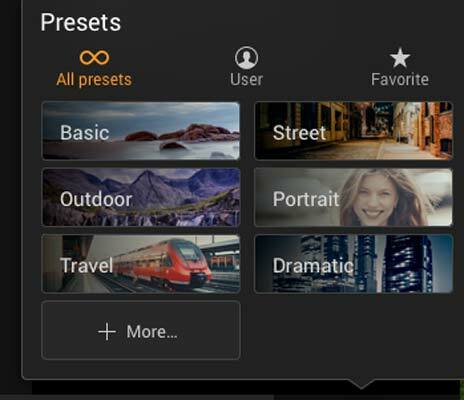 There are more than 60 of these one-click presets you can choose from. However, you can also customise how any of these presets work, or, you can create your own entirely from scratch if you prefer. Let’s assume you want to customise how a particular preset works, after you’ve clicked on it, click on the icon in the top right hand corner of the screen and you’ll see a group of dialogues boxes which you can adjust. 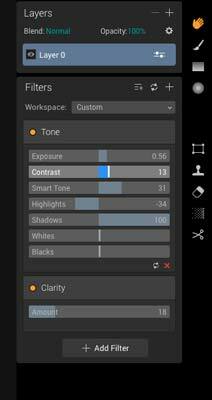 These could be different depending on the preset you have selected, but could include things like Exposure, Contrast, Smart Tone, Highlights and so on. They can all be changed by dragging sliders across to the left or right to add or decrease the specific effect. Drag these to get the effect you want, and again, you could save from here if you wanted to. Alternatively, you could add another filter to your effect, simply by clicking the Add Filter icon. Once you’ve pressed this, you’ll be given a huge array to choose from. If you’re not sure how any of them in particular will work, you can click a double arrow which will reveal more information about each filter and an example of how it will work - unfortunately this isn’t on the photo you’re working on, but it does give you an idea of how it will look. You can sort the filters by all, or by categories, which could help you find what you’re looking for a bit more quickly. Once you’ve added the filter, again you can drag sliders across to adjust how the effect works. You can add any number of filters you want to. If you’re happy with the look you’ve created, you could save it as a preset to be displayed along the bottom with the others. Click the symbol which looks like three lines with a small plus sign on it, give the preset a name and it’ll be saved ready for you to use again. An alternative way to create your own preset, is to start from scratch rather than adjusting or customising an existing one. To do that is also simple. 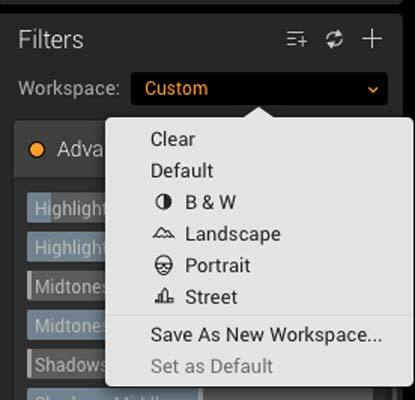 In the Workspace drop down menu, select “Clear” and any presets or filters which you have already applied will disappear. 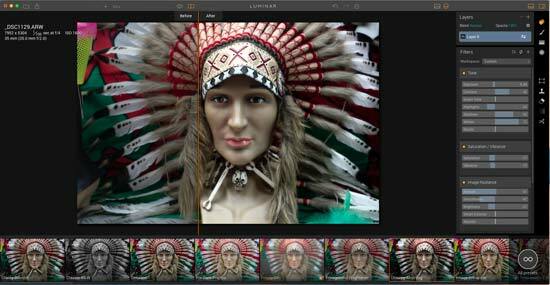 Now you can add filters, building them up in the same way as before, and saving the overall preset if you wish to do so. The workspace drop down menu is a very useful starting point for any editing you want to do in fact. From here, you’ll see that you can start from a clear workspace, or, you can choose from different workspaces depending on the type of image you’re working on. 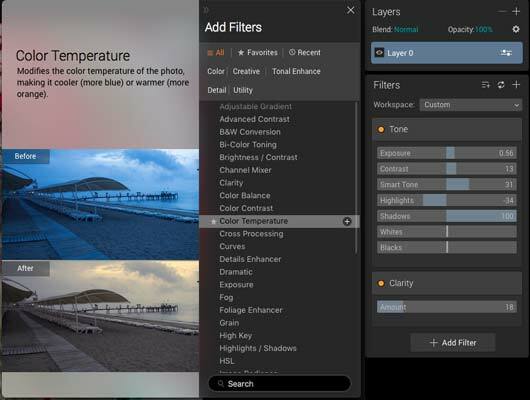 For example, if you choose Landscape, it will display certain filters that the software thinks you are likely to want to use, such as Saturation / Vibrance. Just because the filters are there, doesn’t mean you necessarily have to use them - in fact if you want to remove any that you don’t think you will use, you can just click an “x” mark at the bottom of each individual filter. It’s a very intuitive and simple way to work, and it doesn’t take long to get to grips with how it works. For now, batch processing is not available, which is a shame if you create a preset that you particularly like. However, MacPhun says that it is working on making this available in an update to the software, which is likely to appear in the next few months. Along the top of the workspace, you’ll see some very useful icons. To the left there’s a +/- symbol, which simply allows you to zoom in and out of your image. Next to this is a 100% symbol, which if you click will show you the image at 100% - once you’ve done that, the symbol changes so that if you click on it, the image will fit into the workspace available. Moving a little further along, you’ll see that there’s an eye symbol. Select that and keep it held down and you’ll be able to see a before and after of your image. Just next to that is another icon which will allow you to compare your old image with the edit by dragging a before and after slide across the screen. Moving further along and you’ll see there’s an undo and redo button. Just next to this is the very useful “history” button, this allows you to go back to any point in the editing process, rather than having to start from scratch again, or painstakingly keep pressing the undo button. Moving over to the right hand side of the screen, and there’s a few tools which are reasonably familiar to anybody who’s used something like Photoshop before. There’s a hand tool for moving around your image, a brush tool - with one of its uses being to create a mask for any filter layers you make. A gradient tool is particularly useful when you’re editing skies and so on, in that you can use it to only alter a partial area of the image. The radial mask is similar in allowing you to select certain areas of the image but in a circular fashion, rather than a straight line. 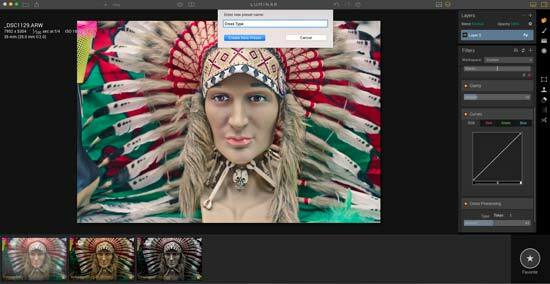 The transform tool allows you to crop and rotate your image, while there's also a Clone and Stamp tool, an erase tool, a de-noise tool, and a crop tool. Most of these tools are pretty self-explanatory, especially again if you’ve been used to using other photo editing tools.